The “code” of this major change to the standard P2002 JF platform, certified under EASA CS-VLA requirements, is “2002/141” but this simple number signifies more than one year of ergonomic studies, test pilot’s overview, component design and input from the disabled community through flying charity Aerobility. The result is the first flight of first worldwide CS-VLA certified aircraft factory built with disabled hand controls installed. Designed with a close collaboration with Aerobility pilots, this production aircraft is equipped with all the standard controls plus a central stick fully integrated into the aircraft control system, enabling the use of rudder pedals, throttle and flap controls by a disabled person with no use of their legs. The entire flight and ground controls are fully operative with the sole use of left and right arms, including braking. 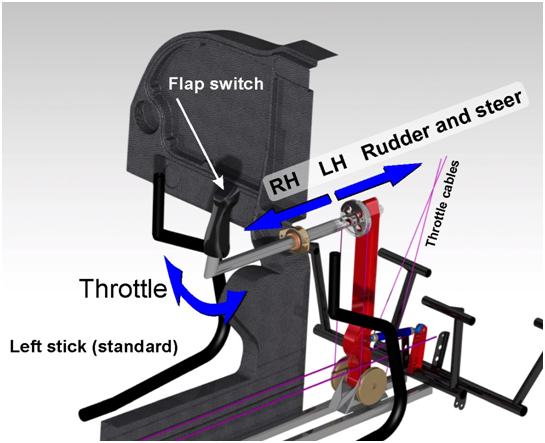 “… after the first flight of this unconventional flight control system, I can easily say that, I learnt how to control the aircraft by hand controls” said Marco Locatelli, Tecnam Chief Test Pilot who performed the first flight of the aircraft and, after just one hour was perfectly able to perform lazy eights and chandelles. Many other small changes on the aircraft have been introduced in order to make the aircraft as disabled friendly as possible with reinforcements on the leading edge, additional grab handles and increased canopy opening. “after 8 enjoyable hard-working years at Tecnam, it is great to celebrate a unique milestone. This first flight is the result of a pleasant design challenge, a strong certification effort by the Tecnam Design Office and the result of a new friendship with Mike and the Aerobility team” said Fabio Russo, Tecnam Chief Project R&D and Product Development. Test flights will continue for about one month before obtaining the final approval of change by EASA, which will set another important milestone in the Tecnam effort in designing and building innovative practical flying machines. Aerobility and Tecnam first collaborated through Tim Orchard, UK dealer for Tecnam (www.tecnamuk.com) working together on creating a spectacular flight over the 2012 London Paralympics Games Opening Ceremony with a P2006T equipped with specifically designed pyrotechnics and lighting. This project created a friendship with Aerobility that has resulted in the development of the disabled adapted P2002JF project. In the following images: hand controls design, control layout and, finally, the successful first flight. 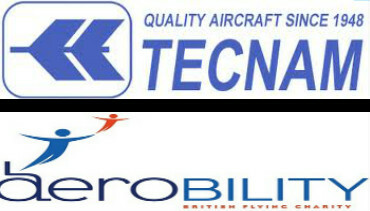 TECNAM traces its roots back to the activities of the Italian brothers Luigi and Giovanni Pascale, who developed and produced innovative aircraft soon after the end of WWII (1948) and have continued ever since to create original models that gained worldwide recognition under the name Partenavia. Established in March 1986, Costruzioni Aeronautiche TECNAM now operates in two production facilities. The Casoria facility is located adjacent to Naples Capodichino Airport. The Capua facility is located adjacent to the “Oreste Salmone” Airport. on behalf of Costruzoini Aeronautiche TECNAM S.r.l.